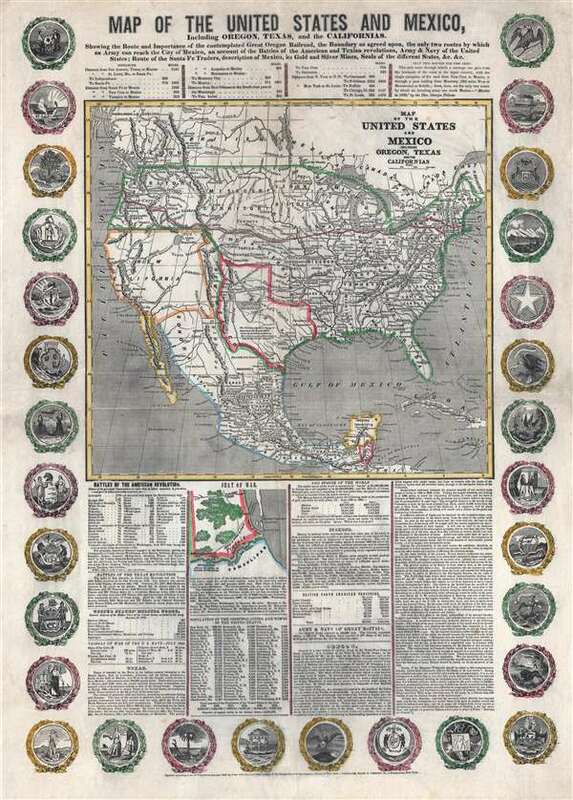 Broadside proclaiming Manifest Destiny published at the outset of the Mexican American War. …it is no extravagance to predict that in less than fifty years, we shall behold in our beloved country, a government holding the preponderance of power, owning a population of a hundred millions, with a central capital in the great valley of the Mississippi, commanding from its nucleus of power and electric communication over three millions of square miles…in a fullness that will realize at last the fondest dreams of the millennium! Arouse then, America, and obey the mandate which Destiny has imposed upon you for the redemption of the World! The text below the map describes Texas, the Texan Revolution, Oregon, argues for the feasibility and virtues of a Transcontinental railroad to Oregon, and simultaneously praises the richness of Mexico and criticizes the incompetence of its governance. At one point the author describes the 'Specie of the World,' in which he is referring to global wealth, and highlights the enormous gold and silver output of Mexico between 1790 and 1830, of which he asks poignantly, 'Where has it all gone?' The implication being that both the United States and Mexico would be better off under U.S. governance. He even offers two suggested invasion routes into Mexico City. Haven also illustrates all three boundaries associated with the 'Fifty-four Forty or Fight!' Oregon Boundary Dispute. The northernmost boundary, initially claimed by the united states at 54° 40' Latitude, the southern boundary, claimed by Great Britain along the Columbia River, and the compromise boundary at the 49th parallel. It is this compromise boundary that the colorist has highlighted suggesting that this map was issued, or at least colorized, after the June 15, 1846 Oregon Treaty. There are at least three variants on this broadsheet, which was printed in three sections – the text, the map, and the medallions. The map appears in another similar broadside, with medallions, but no text (Rumsey 2575). Another variant features a smaller version of the map that does not include Mexico, but with identical text and no medallions (Rumsey 4452). All three appear to have been published in 1846. It is likely that the variant without the medallions is the earliest, followed by the other two. All examples are uncommon and highly desirable. John Haven (fl. c. 1846 – 1850) was a New York and Boston based publisher known for bombastic broadsides advocating American patriotism and Manifest Destiny. He appears to have lived in New York and relocated to Boston between 1848 and 1850. Little else is known of Haven beyond his three major 1846 broadsheet maps promoting Manifest Destiny, all published in New York, and his 1850 broadsheet world map, published in Boston. At least some of his maps were published in concert with one, 'Emerson,' of which no further information is known. Haven's New York offices were located at 3 Broad Street. His Boston offices were at 86 State Street. Very good. Backed on archival tissue. Restoration lower left corner. OCLC 785614872. Wheat, C. I., Mapping of the Transmississippi West, 1540 – 1861, #513, 514, 557. Streeter 3866.